To make a custom template available to Clarify, you place the HTML template folder in the Clarify application support folder. Note that you will need to restart Clarify in order for the template to be available. 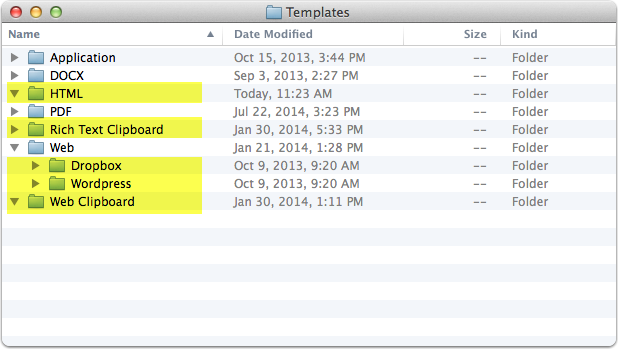 To quickly access the Templates folder use the Help menu and select Reveal Custom Template Folder option. HTML: Templates used when exporting to HTML. Rich Text Clipboard: Template used when copying a Clarify to the clipboard as rich text. If you put a template folder in here it will override the default template that Clarify uses. Web/Dropbox: Templates used for exporting to Dropbox. Web/WordPress: Templates used for exporting to WordPress. Web Clipboard: Templates that are used with the Clipboard Template setting for Clarify-it.com and Dropbox sharing accounts. Prev: What is an HTML template?